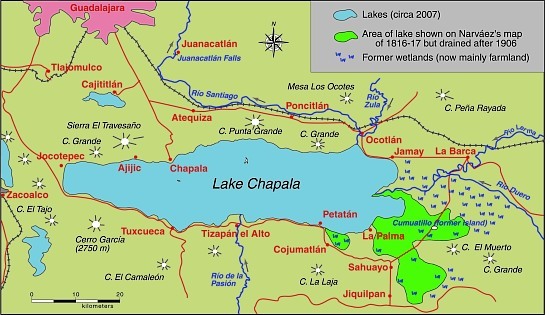 In the 19th century, most of the proposed schemes to change the course or nature of the Lake Chapala area were never carried out. Of those that were implemented, the most significant was the construction in 1883 of the Presa Corona. This dam facilitated the construction of a hydro-power plant at the Juanacatlán Falls. Associated irrigation channels allowed much of the Santiago valley to be farmed all year. At the eastern end of the lake, farmers had tried several times to gain permanent additional land by draining parts of the lakeshore. Calls for more land, and more control over the position of the edge of the lake were renewed following a drought in 1896, and the very low lake level the following year, when the hydro plant had to be taken out of service for lack of water. Engineers decided to build a dam at Poncitlán to regulate the River Santiago and conserve water in times of plenty. A few years later, in 1904, very high floods following the rainy season made landowners even more unhappy. The inauguration of the Poncitlán dam in 1905 ironically meant that water levels remained high each year for longer than usual in the much-coveted eastern marshes. In several places, including Jamay and La Palma, local landowners constructed dykes to prevent the water from covering their fields. Levées were built along the Lerma and its tributary the Duero. Manuel Cuesta Gallardo, a native of Guadalajara, had a much bolder vision, which reflected how successfully Europeans had increased their areas of farmland through drainage and reclamation schemes. He convinced President Porfirio Díaz to award him a concession for the 50,000 hectares of land that would be gained by constructing an 80-kilometer-long earth bank from La Palma to Maltaraña, to completely amputate the eastern end of the lake, the area known as the Ciénega of Chapala. The scheme, designed by engineer Luis P. Ballesteros, also involved digging major drainage channels. All the work was done by hand. By 1908, the work was complete. The following year, disastrous floods overwhelmed the earth banks, destroyed bridges and wrecked crops. Further floods in 1913 caused further damage, but all the dykes were rebuilt by the following year. While the scheme has certainly not prevented occasional flooding, it has increased the agricultural area in the region. But at what cost? Critics say that the delicate ecological balance of the lake was destroyed for ever. The marshland’s natural sponge-like ameliorating effect, soaking up excess rainfall to make it available again in times of drought, was gone for good. The hydrology of Lake Chapala is discussed in chapters 6 and 7 of Geo-Mexico: the geography and dynamics of modern Mexico. A case study of ‘residential tourism’ in the villages on the northern shore of Lake Chapala is discussed in chapter19. Lake Chapala was recently declared an Internationally Important Wetland by the Ramsar Convention, joining a large global network of similarly important wetland sites. The 13th International Living Lakes Conference is being held in Chapala, March 22-25, 2010.